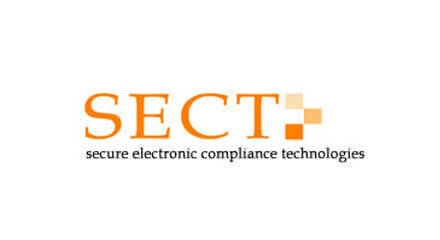 SECURE ELECTRONIC COMPLIANCE TECHNOLOGIES (SECT) INC. Secure Electronic Compliance Technologies (SECT) provides digital signature management solutions for achieving electronic compliance in regulated industries. Even in today’s high-tech world, signatures are still recorded and administered on paper. Medical research requires practically a million personal signatures throughout the design of a new drug. Managing and auditing these ‘signature vaults’ takes many years. The FDA produced Title 21CFR11, a law that pressed the life science industry to speed up the management and auditing of signatures using electronic signatures. This is ment to speed up medical research. SECT’s flagship product ‘Afferent’ is a middleware compliance technology specifically developed to enable life science organizations to fully address the regulatory need created by 21CFR11. ‘Afferent’ seamlessly integrates electronic signature data from across multiple and disparate networks and software applications, dramatically reducing implementation costs, and providing a centralized reporting facility for audit trails and workflow processes. SECT needed a well thought out user interface for ‘Afferent’ that is universal enough for doctors, administrator and other personnel to use on a regular basis. After studying ‘Afferent’ inside out, Giant Step developed a user interface architecture for the middleware product. The interface had many requirements. It had to be modular and scalable, as to fit all types of implementations. We also developed a visual way to simulate the process of approving and declining signatures, based on registered authority levels. The interface was used in various medical research facilities.